It's Monday folks! I know Mondays are usually nothing to be happy about, but not here at Fabricworm! It's time for another giveaway!!! This week we're giving away a bundle from Lori Whitlock's Lazy Day collection in Red! Lori Whitlock's latest collection is just way too cute to handle! Just look at those adorable owls, hot air balloons, and floral coordinates. And check out the Lazy Day Collection here. This giveaway ends on Sunday 4/6 @ 12am PST. The winner will be contacted shortly after by email. The winner will be chosen by random.org through Rafflecopter. I will be a first time grandmother in October...so lots of fun baby things to make! Something for my daughter I think. Maybe turn them into parts of a stuffed toy. Seeing these bright colors is finally bringing spring to Michigan. It's lacking around here. If I won a bundle, I'd cherish for a bit before turning it into girl dresses, ruffles and other fun girly things. I want to make little fabric pouches with these cute spring fabrics! I need this in my life! It's been so dull for me lately. Working this lovely, bright fabric into a cute little quilt for my six month old cousin would definitely make me happy. These are fantastic fabrics. Would make a wonderful girly quilt. I think these would make a great tote for a new momma, or fun placemats for a family, or even an adorable children's quilt! I would make something fabulous for my kids. So cute! I'm making lots of draw string bags lately. Thank you for the giveaway. I would make a quilt for one of my granddaughters - I've got 5 of them! This is the cutest thing ever! Ryabks for the chance to win. Baby quilts galore! I'd make a baby quilt. I'm going to have at least two new nieces and nephews this year! I'd make something fun for my granddaughter with these cute prints! I sew for the children's hospital. I can make everything from dolls to pillows to art holders. You name it, I'll make it!!! this is so adorable. I would make something for my grandkids. I love! I want! I need these pieces! Just love this fabric, is is so fun looking. Makes me smile. Thanks for the giveaway. Love this fabric, it is so happy looking. Makes me smile. Thanks for the giveaway. Love the little owls!! Great fabric for a giveaway!!! Love this adorable collection! I would make our new grand daughter a nice, bright quilt because she is starting to coo and she reminds us of a little "hooty hoot owl"!!! Love the fabric! I could see it in a quilt for my daughter or niece. They'd love it! I would make a beautiful quilt top for the newest member of the family due in May. This is gorgeous fabric! I love fabric and want more!! Something for my newborn niece and a scarf for me. I see a cute quilt for a grandson! I have a precious granddaughter I'd sew for! The bright reds would make a happy quilt top for my grandson. Maybe a kids quilt or cute pillows. My niece just asked me for a quilt-this fabric would be perfect! 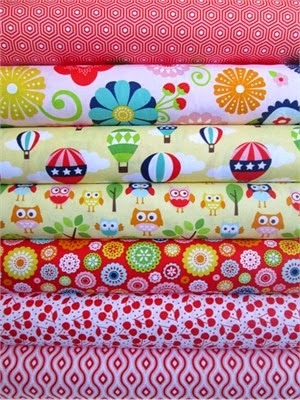 I would probably work on a little baby quilt with these lovely fabrics! Adorable! I think I'd make a bag and a few fabric pins. Too cute! I would use them to make cushion covers for the reading room used by my son's kinder class. I would love to make clothing for my girls with this beautiful fabric! I have lots of tutorials on Pinterest to try!! I'd make a baby quilt. Use them to make my first sewing project for my girl! I'd make a quilt for sure! So cute. Thanks for the awesome giveaway!! I just love fabric! Lovely for a quilt for my little niece. I love making liitle gifts for people. Just this week, I made 2 infinity scarves, a clutch purse, & hair accessories. I love this collection!! I would keep making the toddler softies I have started to love. I NEED this! Lol. First time auntie here, and my niece must have a new little quilt. Darling fabric! My 3-year old niece will be vying for something made with these fabrics! I would use this to make a dress for my daughter. Beautiful fabric collection. Would love to make a quilt for my granddaughter. I would make a cute little skirt for my granddaughter, Nellie. This would make a cute baby quilt! I'd sew a summer skirt for my daughter. I think these would be used for something fun for my granddaughter. Something for my sister. A pillow or a bag maybe! These would make some sweet dresses for my granddaughters. Thank you for the chance to win this beautiful fabric. I would make a tote or two! I make quilts for our local Children's Hospital. A quilt made with this Dorable fabric is sure to bring a smile to the face of a sick child but also their parents. Their child is not forgotten ! Beautiful happy collection! I would make a quilt for the one niece that hasn't gotten one from me yet! I would make a quilt for a friend who's expecting! this will feed my habit for a few days! HOT AIR BALLOONS! I would make a quilt for my granddaughter. This collection has all the things she loves. Thanks for the chance. Great fabric collection. Thanks for the opportunity to enter. These would make really cute doll clothes! Make something for my baby girl, or applique, or make a cute quilt!! I'm thinking it would make some adorable kiddo purses / bags! I'd love to make a little baby quilt...or maybe some project bags. Too adorable! This collection is so cute! I think they would make adorable school accessories (i.e. Pencil Pouch, book covers, make a cover for binders, lunch box)! Love the colors. Would make a quilt for a friend in hospital. I have BBG triplets and would make something for them. I love the owl print!!!! Love it! These fabrics would make a darling baby quilt and absolutely perfect for my friend who is expecting her first baby!!!! Bright bold colors, love it!! I would make some baby quilts, bibs and toys. Thanks for the chance to win! I would use the fabric to make a quilt for my youngest daughter! One of my granddaughters has outgrown her toddler bed, so she also needs a new quilt. I'm sure this cute fabric collection would make an adorable quilt that would make her very happy! I would make some Easter gifts for my Granddaughter. Son metaipbOne of my granddaughters has outgrown her toddler bed, so she also needs a new quilt. I'm sure this cute fabric collection would make an adorable quilt that would make her very happy! Such cute fabric! I work with girls that have been placed in a therapeutic environment...these fabrics would be perfect for small projects because they are so happy! I would love these to make summer twirly skirts for my daughters! Happiness in a textile form! I'm thinking pillowcases for my granddaughters, perhaps a baby quilt, ooooh, so hard to decide! I think I'd incorporate into kids clothes! i see a lap quilt for a friend from this fabric! so cheery and bright! Every year in St Louis, there is a Hot Air Balloon Festival.....I would make dresses for my 5 and 6 year old daughters to wear to the Festival! Something for my grand daughter Lucy! I would make a cute baby quilt with these fabrics. Such cute fabrics - I would make a baby quilt. Such cute fabrics. I would make a baby quilt. I think I would make something fun for my daughter...she is whimsical like this fabric. That's amazing, I was just looking at this fabric collection this morning and thinking "I need to make a baby quilt!" Something awesome for my daughter! I will add onto my hexie blanket. I would make a beautiful summer dress for my little girl! Would love to sew with these. Cute patterns! There are many things I can do! I could do small projects such as pincushions or mug rugs. I could also make a quilt with them adding fabrics. These fabrics are too cute! They have to be used in a special way. This fabric is so cute!! I would have to make by 3-yr old granddaughter some sweet spring/summer outfits. Thanks for the giveaway. We all want this fabric, and I hope the winner will love it!! I love this fabric so I would have to make a quilt for my bed I love it. I will make a baby quilt for my 4th grandchild who is expected in September. Thanks for the chance to win. A great quilt for my 7th grandchild coming in September. I'd make a baby quilt! Thanks for the chance. I would make a baby quilt for the girl that works at the local Mini mart.. her hubby is overseas and she doesn't have family here. Baby clothes for my newest great niece Kitri Elin. A quilt for my two year old. love love love all the colors!!! i'd definitely make a blanket with this cute bundle!! I would love to make a pretty quilt, thanks! I have several grandchildren that would love a quilt made from this fun fabric. With the good news I got today,I have twin grand babies due in the fall,from one of my twin daughters . I also have another grand baby or it also could be twins from my son and daughter inlay,in which has already gave me twin grandsons and there are 3 little guys after them,so I have 5 grandsons. I have to wait and see what the new babies are,healthy is the most important. But anyway,I would make them little hats,pants,little chew ribbon blankets,little shoes.jackets. Or I could make some bags,or appliqués,potholders.Wow there are so many things I can make!!!!! I love the fabric. I will make adorable outfits for my beautiful granddaughter! I would love to make pot holders and bibs with these. Beautiful prints! So adorable! Straight into stash then into a quilt! I'm teaching myself to sew but I think this would make a beautiful quilt. What a fun, bright bundle! Love to make a quilt for my daughter! I want this collection to make cute handbags! I'd make a lap quilt. Adorable fabric! It's perfect for a lap quilt-- or an Amy Butler Weekender bag-- or several pillows. Just love it! I think they would have to be made into a bag the fabric is sooo cute! I would make a few fabric baskets for my "new-mom" friend. I would love to make something cute for my grand daughters. I would make a blanket for my daughter. These fabrics would make into a darling quilt for a very special child. I would make a baby blanket! I would give them to my Mother-in-law the quilter & hope that she shows me how to quilt a cute table runner. Love these bright and cheery fabrics. I'd like to make a lap quilt for my deck chair. Such happy colors and designs. Thanks for the opportunity to win. I would love to make a lap quilt. Such pretty colors! New grand baby due in October- I need t get sewing, and this adorable fabric would be so inspiring. Wonderful fabric. I'd make a quilt. I just got my sewing machine out of storage from over two years ago when I lost my pancreas transplant. I need some cute fabric to celebrate being alive! Hot Air Balloons are so cool!